It may seem like most of us in modern society live the ordinary life: Wishing for the happiness of self, family, and loved ones. Some, however, live an unimaginable life, with a past that could only be understood by few, and carry a fate so vast upon them. The characters that appear in this story each carry such deep scars or secrets, and are burdened to their destiny. "Breathless Summer" picks up on a rather rare social situation where a girl grows up without a family register. In other words, without citizenship to her own country. As she uncovers the truth about her identity, she comes across an older man, most likely as old as her father, with a scarred heart. 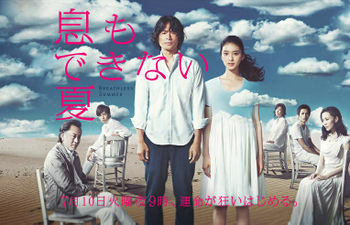 Amidst crossing paths and being torn apart from their surroundings, the two become inseparable to each other, what becomes a shocking but bittersweet summer love story.Tanizaki Rei, the girl without a family registry is played by Takei Emi. Rei is an innocent 19 year old girl, one that you may find anywhere else in the world, excited about what her forthcoming future might bring. Coincidentally, she finds out the truth about her background, that she isn't recorded as being born in the legal books. The truth shocks her, brings her down in thinking that she does not truly exist in the societal world.The older man that she meets, is a 41 year old former newspaper reporter Kiyama Ryuichiro. When Ryuichiro was still a news reporter for a major newspaper, his inherent composure and sense of justice in saving the weak led him to uncover exclusive scoops. It was not until a twist of fate involved him in an accident that he is forced to leave the firm. Now he lives quietly in the suburbs working night shifts at the ward office.Japan's civil code 772 states that if a child is born between a couple where the wife had been in a prior marriage less than 300 days ago, the child will be registered under the prior husband's family register even if DNA tests prove that the child is that of the new couple. This questionable law was in effect for over 110 years without ever being amended, thus creating children who grow up to be without a family registry. One may think; "What are the chances?" But the incident portrayed can happen to anyone, and it is a fact that such children exist in this country.How will Rei face her destiny and overcome it? Will Ryuichiro be able to admit to his sins to find meaning in his life? What will become of their love? Brutal as it may be, the drama will shine light on how wonderful it is to live and love through a complicated family relationship. Expect nothing less than a sensational social entertainment drama this summer!